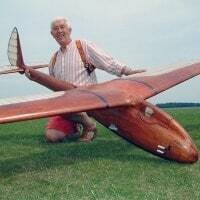 This scale model of a simple single seat standard class sailplane from the 1960s, was designed by Mike Trew. The EoN 460 series are wooden single-seat standard class sailplanes, built in the UK in the 1960s. It did not have major competition success but some remain in use in 2017. 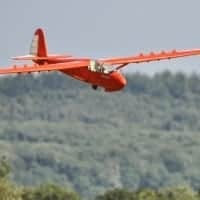 The name Eon 460, sometimes written as Eon Olympia 460, stands both for a series of gliders and for the prototypes of the series, all described by EoN as Type 10. Five slightly different model 460 prototypes were followed by 48 production model 463s. Two model 465s, with slimmer, slightly longer fuselages made possible by a semi-reclining pilot’s position, were built for the 1965 World Gliding Championships. They were the last gliders designed and built by Elliotts of Newbury before their takeover by Slingsby Sailplanes in March 1966. All the 460 series have wooden structures and are largely plywood skinned. They have straight-tapered cantilever shoulder wings with 5° of dihedral and fabric covering over the plywood skin. The prototypes and production 463s have fabric-covered Frise type ailerons; the type 465 has sealed, pendulum-type ailerons. 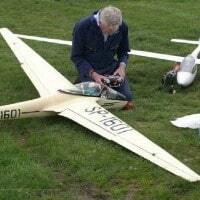 All have plywood DFS type airbrakes extending above and below the wings; standard class gliders do not carry flaps. The straight-tapered tail surfaces are fabric covered. The rudder runs to the keel via a cut-out in the horizontal trailing edge. 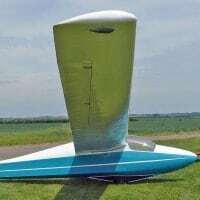 The tailplane is a cantilever structure, mounted on top of the fuselage, folding upwards for transport and carrying conventional split elevators with a starboard trim tab on the prototypes and production 463s. The 465s have non-folding all-moving tailplanes with tabs on both trailing edges. The fuselage is a flat-sided Warren girder structure, plywood covered apart from the curved glass fibre rear decking. Wing attachment involves some aluminium fittings. The single seat cockpit is ahead of the wing leading edge under a single piece canopy. All 460 series aircraft use a fixed, unsprung monowheel main undercarriage. On the first four prototypes at least, this was mounted below the fuselage in a fairing which exposed only the edge of the wheel. On the 463s, the wheel is unfaired but assisted by an integral skid. The 465s have no skid and the wheel mounting is instead raised into the fuselage. All have a tail bumper with a “roller skate” tailwheel. The Eon 460 first flew on 26 April 1960 then went to RAE Bedford for testing and, whilst there, took part in the RAF and Interforces Competition held at RAF Odiham in July that year. This machine, registered as G-APWL and designated 460 Type A had a wing with aspect ratio 20 and an all-up weight of 600 lb (272 kg). It was followed by the Type B with aspect ratio of 18 and an all-up weight of 630 lb (286 kg), the values adopted for production machines. Both these aircraft had performances limited by turbulence generated behind the canopy so were followed by the Type C which was like the Type A but had a longer, lower hood and upper decking. The final prototype variant was the Type D, like the Type C but with modified outer wing sections. Production machines, produced from April 1963 were as the Type D but with wings of aspect ratio 18. Three EoN 460s, the first three prototypes with the Type A modified to Type C canopy style, competed without success in the 1961 National Championships, failing to finish in the top five places and outperformed by earlier EoN Olympia variants. 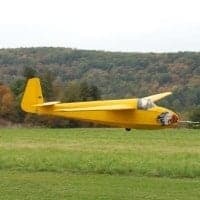 Both the EoN 465s competed in the 1965 World Gliding Championships held in the UK at South Cerney but performed poorly, placed 9th and 41st out of a field of 45 in the Standard Class. A 463 also competed, finishing 40th. Most of the 460 series aircraft flew with clubs and private owners in the UK, including five used by Royal Air Force Gliding & Soaring Association branches. Some are still flying, including BGA1296 (“BWE”), which was at the Vintage Glider Club rally held at Tibenham in August 2010. Four 463s went to New Zealand, one 463 and the first 465 to South Africa and one 463 to Croatia.